The ruined city of Pompeii lies at the foot of Mount Vesuvius, the volcano whose eruption in AD 79 engulfed and subsequently encased the city in six meters of ash and pumice-stone. Excavated over several centuries, what we see today, together with the neighboring site of Herculaneum, gives the finest example anywhere of a Roman town and its way of life. It's easy to see why this is one of Italy's most popular attractions for tourists. Only 16 years before its destruction, Pompeii was badly damaged by an earthquake from which its population of 20,000 had not yet finished rebuilding. At the first sign of the eruption, people began leaving, so when the final flow descended like a tidal wave, only about 2,000 people remained trapped in the city. Abandoned ever since, Pompeii started to emerge when excavations began in the 18th century and since then, about three-fifths of the total area (the city walls had a perimeter of three kilometers) have been recovered. Early excavators took everything to the museum in Naples, but archaeologists since 1911 have left artifacts in place, making the more recently excavated areas the most interesting. Expect to be surprised at how vivid an impression of ancient life you get in its homes, shops, and public places. The feeling is inescapable that when the eruption came, everyone had been in the middle of going about their normal daily business, never dreaming that their last acts would become a window into history. 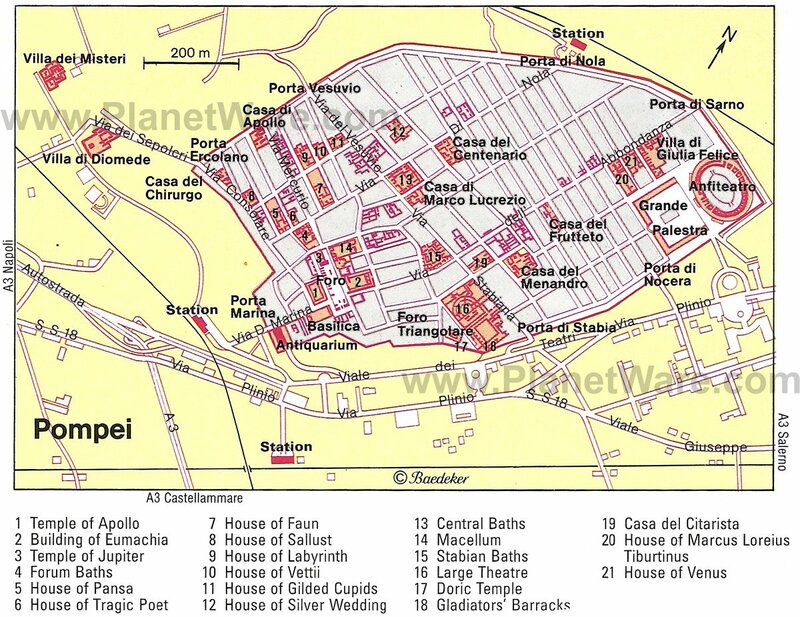 Pompeii is easily reached from Naples or Sorrento and even as a day tour from Rome. Anxious though you may be to explore this fabled city, it really is worthwhile to stop in this museum first. You'll not only find helpful interpretive displays, but you'll see many of the artifacts found during the excavations that were either too fragile or too prone to weathering to be left in place. Some of these date to long before the Roman era. Here, you'll see the implements of everyday life - rows of amphora and other vessels, furnishings, and small household and commercial items. Along with these are the plaster casts made from almost perfect molds left in the solidified ash by the bodies of those caught in the sudden destruction. As these spaces were found by excavators, they were carefully filled with plaster, forming images of the victims as they tried to escape. They bring those final moments into grisly reality and make Pompeii more than just a historic relic. The principal square of a Roman town, the Forum is enclosed by colonnades and bounded on the north by the Temple of Jupiter, rising on a three-meter base. At the corner to its right is the Macellum, a hall for selling food. Various shrines, temples, and other buildings surround the Forum - the Shrine of the Lares; the Temple of Vespasian; a hall for selling wool; and the Curia, where the town council met. Nearby, the basilica was used as a market and a law-court. To its left, the Temple of Apollo is surrounded by 48 Ionic columns. One of the newer homes to be opened is that of Triptolemus, in front of the basilica. Dating from the second century BC, this was obviously owned by a prosperous and important family, as you can tell by its two atriums (courtyards) and two peristyles (columned garden courtyards). Built into the sloping ground, the Teatro Grande (Large Theater) could seat 5,000 spectators and is used for Son et lumière shows in summer. The top row commands one of the best views of the city and Vesuvius. The adjoining Teatro Piccolo (Little Theater), better preserved and the earliest example of a roofed Roman theater, dates to about 75 BC. It would have been used mainly for musical performances. East of the Little Theater is the Tempio di Giove Meilichio and the adjacent Tempio di Iside - Temple of Isis - you can still see an inscription scratched on its walls by the French novelist Stendhal in 1817. Enter the tree-shaded Triangular Forum, intended mainly for theater-goers, through a fine arcade to get to gladiators' barracks. Inscriptions recording their successes in gladiatorial games were found on its columns. At the corner of Via dell'Abbondanza and Via Stabiana are the largest and best-preserved baths in Pompeii. The entrance leads into the colonnaded palaestra, with a swimming pool on the left; on the right are the male and female baths, separated by the stoves for heating the water. Each facility has a circular cold bath (frigidarium), a changing room (apodyterium) with racks for clothing, a warm bath (tepidarium), and a hot bath (caldarium) heated by air-ducts in the floor and walls. Gladiators trained in the gymnasium, which was also part of the Stabian complex. The large, well-preserved House of Menander belonged to a wealthy merchant who gave notice of his status right at the entrance, which is flanked by pillars with Corinthian capitals. The well-preserved atrium has a little temple in one corner and an intact wooden roof that extends out to the center opening, where water drained to collect in the pool below. Interior rooms are decorated with scenes from Homer's Iliad, and the peristyle is surrounded by a beautiful painted colonnade. Adjoining this is the charming little House of the Lovers, named for an inscription that translates "lovers, like bees, wish life to be as sweet as honey." Farther along Via dell'Abbondanza, on the left, is the Thermopolium, a tavern fully equipped with drinking vessels, a kettle, a stove, and a lamp; the last customer's money is still on the counter. At the farther end of Via dell'Abbondanza, on the right, is the beginning of the New Excavations, where wall paintings and furniture have been left in place. In many of the houses, the upper story, with its balconies and loggias, has been preserved by girders, giving a better idea of how these looked two millennia ago. Mosaics, statues, frescoes, and furnishings are still here, along with election posters and other casual inscriptions painted on the walls. 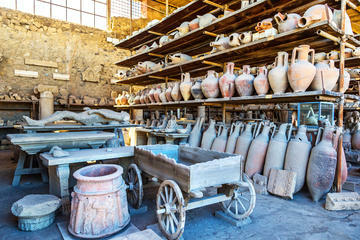 This part of the town dates from Pompeii's final period, and most of the homes and shops belonged to tradesmen. Look for an ironmonger's shop and a fuller's and dyer's workshop (Fullonica di Stefano), with two restored pressing machines. In the Cryptoporticus house, a magnificent painted frieze in a passage leading to the cellar illustrates scenes from the Iliad and other Homer poems. In the Casa della Venere (House of Venus) is one of the loveliest frescoes in Pompeii, showing Venus on a seashell. Dating from 80 BC, the massive Amphitheater at the far end of Pompeii, which seated 12,000 spectators, is the oldest surviving Roman amphitheater. Right next to it is the Palaestra, with colonnades around three sides and a swimming pool in the center. Beyond the Porta di Nocera, outside the city walls, is a necropolis (cemetery), much like those that lay outside the walls of all Roman (and other) ancient towns. The House of the Vettii in the Vicolo di Mercurio is one of the most interesting in Pompeii. This was the home of two well-off middle-class brothers, and it shows that it was not just the aristocracy who lived well in elegantly decorated homes. This house has some of the best frescoes, as well as a peristyle that still has its original marble decoration, and whose garden has been replanted, so you can see what it looked like when people lived here. The kitchen still contains its cooking utensils. From their style, art historians think that the fresco painting in the interior was done after the devastating earthquake of AD 62. The most famous of the frescoes are in the triclinium, where they completely cover the walls in faux panels with mythological scenes and a long frieze of cupids. The colors are especially intense. The walls under the colonnade of the peristyle are also painted to imitate panels. In the same neighborhood, near Porta Ercolano, are several houses worth seeing. Opposite the House of the Vettii, the House of the Faun is the most palatial mansion in Pompeii, but sadly all its art treasures - including outstanding mosaics - were carted off to the museum in Naples. Next to the House of Siricus is a bakery on whose threshold is inscribed "Salve lucrum" (Long live profit); perhaps they spent theirs on the fine paintings inside. Farther along the Via Stabiana, on the right, the House of Marcus Lucretius has well-preserved paintings, and the House of the Silver Wedding has a fine atrium and peristyle. The garden of the elegant House of the Gilded Cupids (Casa degli Amorini Dorati) still preserves its original marble decoration. North of the Forum Baths, smaller and more modest than the Stabian Baths, is the richly appointed House of the Tragic Poet. On its threshold, you'll find one of Pompeii's most famous mosaics, of a chained dog with the inscription "Cave canem" (Beware of the dog). On its north side is a fuller's workshop, to the left of which are two houses with beautiful fountains. Outside the walls of Pompeii, through Porta Ercolano, is a suburban district whose main street has been excavated. This Street of Tombs is lined with imposing funeral monuments, ranking with the Via Appia outside Rome as the most impressive surviving example of this Roman practice of building tombs along public roads. At the northwest end is the large Villa of Diomedes, with an extensive garden enclosed by a long portico. Ironically, the house itself became a tomb in the volcanic eruption: in an underground passage, excavators found the bodies of 18 women and children. Near the garden door was the body of a man with a key in his hand and a slave beside him carrying money and valuables. Also outside the main excavation area and beyond the Villa of Diomedes is the magnificent Villa of the Mysteries (Villa dei Misteri). Your ticket includes admission here. This villa, built in the second century BC, contains what many consider to be the finest surviving ancient wall paintings, preserved in all the brilliance of their original colors. The most remarkable of these is a frieze 17 meters long in the large triclinium, so large that its figures are almost life-size. It is thought that the villa had been converted into a Dionysian cult meeting place, and the scenes in these paintings show followers engaged in the mysteries of initiation. 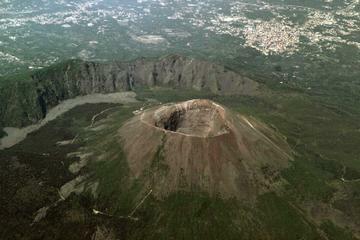 Bosco de' Medici: 4-star resort, peaceful countryside location, fabulous pool with Mount Vesuvius views, friendly staff. Hotel Forum Pompei: mid-range pricing, spacious rooms, comfortable beds, lovely garden with lemon trees. Hotel Diana Pompei: affordable rates, near the train station, helpful staff, family-run, colorful decor. Hotel Pace Pompei: budget hotel, great-value, central location, welcoming hosts, multilingual staff. Tours of Pompeii: Combining the ancient city with a hike to the top of the volcano that destroyed it, the Mt Vesuvius and Pompeii Day Trip from Naples is a seven-hour small-group tour. During the air-conditioned bus ride from central Naples, your expert guide will provide the historical background for the two-hour guided walking tour of Pompeii; the tour also includes a traditional Italian pizza lunch. You can also hike up the volcano to walk along its rim on the Pompeii Day Trip from Rome, a 13-hour guided tour that includes a stop in Naples for the famous Neapolitan pizza before a guided tour that brings ancient Pompeii to life. From mid-November through March, when the Vesuvius summit trail is closed, the guided hike is replaced with a tour of the National Archaeological Museum of Pompeii. Tickets: If you plan to visit both Pompeii and Herculaneum, the combined ticket is cheaper than two separate entrance fees. For Your Comfort: There is free luggage checking at the entrance, where you should also pick up the free map. Getting to Pompeii on Your Own: The Circumvesuviana trains connecting Naples and Sorrento stop at Pompeii.